These stuffed strawberries make the perfect little appetizer. They encompass sweet, savory and crunch all in one delectable bite! Wash strawberries and remove stems and core. In a small bowl, combine yogurt, cream cheese and blue cheese until well mixed. 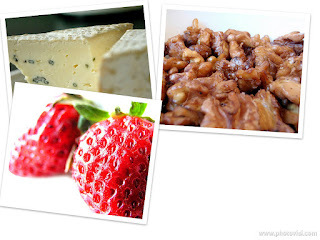 Fill the strawberries with the cheese mixture and top with candied walnuts. Chill until ready to serve.